A new study (3) suggests an elegantly simple and intuitive (10) answer: look at an athlete's total score on their initial assessment of injury severity on the Post-Concussion Symptom Scale (PCSS)(4) to determine the risk of prolonged recovery; the higher the score, the greater the severity and the greater the chance those symptoms will linger for a month or more. MomsTEAM concussion expert, Dr. William P. Meehan, III, and colleagues from Boston Children's Hospital and the University of Pittsburgh Medical Center analyzed data from 182 patients seen at a sports concussion clinic within 3 weeks of injury. 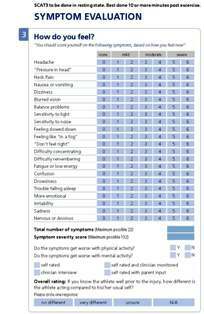 Patients were asked to report and rate the severity of the symptoms they experienced at the time of the concussion on a seven-point scale using the PCSS, a widely-used (5,6) and reliable symptom inventory, and then report and rate for severity those which were still present within 24 hours before clinic visits four weeks later. Comparing patients who were symptom-free within 28 days and those who still had symptoms after 28 days, and after analyzing data for several variables, including total score of the PCSS at initial visit, age, and amnesia symptoms, the researchers found that only the total score on the PCSS was independently associated with symptoms lasting longer than a month, and that the higher the score, the greater the odds of a prolonged recovery time. "The ability to distinguish between those patients who will likely suffer prolonged symptoms and those who will likely recover more quickly would help patients and clinicians better prepare for prolonged recovery," writes Dr. Meehan, including "determining the need for academic accommodations, allowing athletic teams and coaches to plan for the prolonged absence of a player," and allowing clinicians to "better predict which patients are likely to need medication for prolonged symptoms." Based on the results of the study, Dr. Meehan recommends that "Parents, physicians, and caregivers of athletes who suffer from a high-degree of symptoms after a sports-related concussion start preparing for the possibility of a prolonged recovery." Age and Amnesia: Risk Factors for Prolonged Recovery? Although some studies have shown longer recovery times in younger patients (which may be attributable in part to a tendency by health care providers to treat younger patients more conservatively) and in patients who suffered from amnesia, prompting some groups (5,9), to list both as possible risk factors, the new study suggests that age or amnesia are not risk factors for prolonged recovery time. The finding that amnesia was not predictive of a longer recovery is consistent with a 2011 study (7) by researchers at the University of Pittsburgh (one of whom co-authored the current study), which found that neither anterograde amnesia (ability to recall events occuring before injury) nor retrograde amnesia (ability to form new memories after injury) were predictive of protracted recovery (21 days or more to return to play), although the authors of that earlier study speculated that their results could possibly be attributed to the normal acute response to a concussion, most of which resolve relatively quickly with little lasting effects. Their warned, however, that their findings "should be interpreted cautiously ..., as previous research had supported retrograde amnesia and PTA as predictors of poor concussion outcomes (although not protracted recovery times per se). the fact that the list of potential predictors of prolonged recovery "is extensive, even limitless,"
and the fact that "the role of individual symptoms, such as anxiety, could not be properly analyzed in conjunction with all of the other factors assessed in this study. "Although our findings reveal an independent association between PCSS score and prolonged recovery," Meehan writes, "they do not allow for precise calculation of the probability that an individual athlete will suffer a prolonged concussion. Thus, he said, the study's findings will likely be most useful in the "development of a clinically relevant prediction model than for direct clinical management." 1. Meehan W, d'Hemecourt P, Comstock R. High school concussions in the 2008-2009 academic year: mechanism, symptoms, and management. Am J Sports Med 2010;38:2405-2409. 2. Meehan W, d'Hemecourt P, Collins C, Comstock R. Assessment and management of sport-related concussions in United States Hhigh schools. Am J Sports Med 2011;39:2304-2310. 3. Meehan W, Mannix R, Straccioloni A, Elbin R, Collins M. Symptom Severity Predicts Prolonged Recovery after Sport-Related Concussion, But Age and Amnesia Do Not. J Pediatrics 2013:DOI 10.1016/j.jpeds.2013.03.012 (published online ahead of print April 25, 2013). 4. Pardini D, Stump JE, Lovell MR, Collins MW, Moritz K, Fu FH. The post-concussion symptom scale (PCSS): a factor analysis. Br. J Sports Med. 2004;38:661-662. 5. SCAT3, Br J Sports Med 2013;47:259. 6. McCrory P, et al. Consensus statement on concussion in sport: the 4th International Conference on Concussion in Sport held in Zurich, November 2012. Br J Sports Med 2013;47:250-258. 7. Lau BC, Kontos AP, Collins MW, Mucha A, Lovell MR. Which On-field Signs/Symptoms Predict Protracted Recovery From Sport-Related Concussion Among High School Football Players? Am. J Sport Med 2011;20(10):DOI:10.1177/0363546511410655 (published June 28, 2011 online ahead of print)(accessed November 5, 2011). 9. Giza C, Kutcher J, Ashwal S, et al. Summary of evidence-based guideline update: Evaluation and management of concussion in sports: Report of the Guideline Development Subcommittee of the American Academy of Neurology. Neurology. DOI:10.1212/WNL.0b13e31828d57dd (published online before print March 18, 2013). 10. Guskiewicz K, et al. Evidence-based approach to revising the SCAT2: introducing the SCAT3. Br J Sports Med 2013;47:289-293 (symptom severity score is intuitive in that it is the sum of the Lykert ratings for the entire scale).